Solr’s Parallel SQL Interface brings the power of SQL to SolrCloud. The SQL interface seamlessly combines SQL with Solr’s full-text search capabilities. Both MapReduce style and JSON Facet API aggregations are supported, which means the SQL interface can be used to support both high query volume and high cardinality use cases. The SQL interface allows sending a SQL query to Solr and getting documents streamed back in response. Under the covers, Solr’s SQL interface uses the Apache Calcite SQL engine to translate SQL queries to physical query plans implemented as Streaming Expressions. In a standard SELECT statement such as SELECT <expressions> FROM <table>, the table names correspond to Solr collection names. Table names are case insensitive. Column names in the SQL query map directly to fields in the Solr index for the collection being queried. These identifiers are case sensitive. Aliases are supported, and can be referenced in the ORDER BY clause. The * syntax to indicate all fields is not supported in either limited or unlimited queries. The score field can be used only with queries that contain a LIMIT clause. The collection in Solr we are using is "techproducts", and we’ve asked for the "manu" and "price" fields to be returned and aliased with new names. While this example does not use those aliases, we could build on this to ORDER BY one or more of those fields. More information about how to structure SQL queries for Solr is included in the section Solr SQL Syntax below. facet: This is the default aggregation mode, which uses the JSON Facet API or StatsComponent for aggregations. In this scenario the aggregations logic is pushed down into the search engine and only the aggregates are sent across the network. This is Solr’s normal mode of operation. This is fast when the cardinality of GROUP BY fields is low to moderate. But it breaks down when you have high cardinality fields in the GROUP BY field. map_reduce: This implementation shuffles tuples to worker nodes and performs the aggregation on the worker nodes. It involves sorting and partitioning the entire result set and sending it to worker nodes. In this approach the tuples arrive at the worker nodes sorted by the GROUP BY fields. The worker nodes can then rollup the aggregates one group at a time. This allows for unlimited cardinality aggregation, but you pay the price of sending the entire result set across the network to worker nodes. These modes are defined with the aggregationMode property when sending the request to Solr. As noted, the choice between aggregation modes depends on the cardinality of the fields you are working with. If you have low-to-moderate cardinality in the fields you are grouping by, the 'facet' aggregation mode will give you a higher performance because only the final groups are returned, very similar to how facets work today. If, however, you have high cardinality in the fields, the "map_reduce" aggregation mode with worker nodes provide a much more performant option. The request handlers used for the SQL interface are configured to load implicitly, meaning there is little to do to start using this feature. The /sql handler is the front end of the Parallel SQL interface. All SQL queries are sent to the /sql handler to be processed. The handler also coordinates the distributed MapReduce jobs when running GROUP BY and SELECT DISTINCT queries in map_reduce mode. By default the /sql handler will choose worker nodes from its own collection to handle the distributed operations. In this default scenario the collection where the /sql handler resides acts as the default worker collection for MapReduce queries. By default, the /sql request handler is configured as an implicit handler, meaning that it is always enabled in every Solr installation and no further configuration is required. As described below in the section Best Practices, you may want to set up a separate collection for parallelized SQL queries. If you have high cardinality fields and a large amount of data, please be sure to review that section and consider using a separate collection. The Streaming API is an extensible parallel computing framework for SolrCloud. Streaming Expressions provide a query language and a serialization format for the Streaming API. The Streaming API provides support for fast MapReduce allowing it to perform parallel relational algebra on extremely large data sets. Under the covers the SQL interface parses SQL queries using the Apache Calcite SQL Parser. It then translates the queries to the parallel query plan. The parallel query plan is expressed using the Streaming API and Streaming Expressions. Like the /sql request handler, the /stream and /export request handlers are configured as implicit handlers, and no further configuration is required. In some cases, fields used in SQL queries must be configured as DocValue fields. If queries are unlimited, all fields must be DocValue fields. If queries are limited (with the limit clause) then fields do not have to be have DocValues enabled. The SQL Interface provides a basic JDBC driver and an HTTP interface to perform queries. The connection URL must contain the zkHost and the collection parameters. The collection must be a valid SolrCloud collection at the specified ZooKeeper host. The collection must also be configured with the /sql handler. The aggregationMode and numWorkers parameters are optional. Solr accepts parallel SQL queries through the /sql handler. Notice that the result set is an array of tuples with key/value pairs that match the SQL column list. The final tuple contains the EOF flag which signals the end of the stream. Solr supports a broad range of SQL syntax. The SQL parser being used by Solr to translate the SQL statements is case insensitive. However, for ease of reading, all examples on this page use capitalized keywords. Solr supports limited and unlimited select queries. The syntax between the two types of queries are identical except for the LIMIT clause in the SQL statement. However, they have very different execution plans and different requirements for how the data is stored. The sections below explores both types of queries. We’ve covered many syntax options with this example, so let’s walk through what’s possible below. The WHERE clause must have a field on one side of the predicate. Two constants (5 < 10) or two fields (fielda > fieldb) is not supported. Subqueries are also not supported. The predicate above will execute a full text search for the phrase 'term1 term2' in fieldC. The predicate above searches for term1 OR term2 in fieldC. Some operators that are not supported are BETWEEN, LIKE and IN. However, there are workarounds for BETWEEN and LIKE. BETWEEN can be supported with a range query, such as field = [50 TO 100]. A simplistic LIKE can be used with a wildcard, such as field = 'sam*'. The ORDER BY clause maps directly to Solr fields. Multiple ORDER BY fields and directions are supported. The score field is accepted in the ORDER BY clause in queries where a limit is specified. If the ORDER BY clause contains the exact fields in the GROUP BY clause, then there is no-limit placed on the returned results. If the ORDER BY clause contains different fields than the GROUP BY clause, a limit of 100 is automatically applied. To increase this limit you must specify a value in the LIMIT clause. Order by fields are case sensitive. Limits the result set to the specified size. In the example above the clause LIMIT 100 will limit the result set to 100 records. Limited queries support score in the field list and ORDER BY. Unlimited queries do not. Limited queries allow any stored field in the field list. Unlimited queries require the fields to be stored as a DocValues field. Limited queries allow any indexed field in the ORDER BY list. Unlimited queries require the fields to be stored as a DocValues field. The SQL interface supports both MapReduce and Facet implementations for SELECT DISTINCT queries. The MapReduce implementation shuffles tuples to worker nodes where the Distinct operation is performed. This implementation can perform the Distinct operation over extremely high cardinality fields. The Facet implementation pushes down the Distinct operation into the search engine using the JSON Facet API. This implementation is designed for high performance, high QPS scenarios on low-to-moderate cardinality fields. The SQL interface supports simple statistics calculated on numeric fields. The supported functions are count(*), min, max, sum, and avg. Because these functions never require data to be shuffled, the aggregations are pushed down into the search engine and are generated by the StatsComponent. The SQL interface also supports GROUP BY aggregate queries. As with SELECT DISTINCT queries, the SQL interface supports both a MapReduce implementation and a Facet implementation. The MapReduce implementation can build aggregations over extremely high cardinality fields. The Facet implementations provides high performance aggregation over fields with moderate levels of cardinality. count(*): Counts the number of records over a set of buckets. sum(field): Sums a numeric field over over a set of buckets. avg(field): Averages a numeric field over a set of buckets. min(field): Returns the min value of a numeric field over a set of buckets. max:(field): Returns the max value of a numerics over a set of buckets. The non-function fields in the field list determine the fields to calculate the aggregations over. It makes sense to create a separate SolrCloud collection just for the /sql handler. This collection can be created using SolrCloud’s standard collection API. Since this collection only exists to handle /sql requests and provide a pool of worker nodes, this collection does not need to hold any data. Worker nodes are selected randomly from the entire pool of available nodes in the /sql handler’s collection. So to grow this collection dynamically replicas can be added to existing shards. New replicas will automatically be put to work after they’ve been added. An earlier section describes how the SQL interface translates the SQL statement to a streaming expression. One of the parameters of the request is the aggregationMode, which defines if the query should use a MapReduce-like shuffling technique or push the operation down into the search engine. The Parallel SQL architecture consists of three logical tiers: a SQL tier, a Worker tier, and a Data Table tier. By default the SQL and Worker tiers are collapsed into the same physical SolrCloud collection. The SQL tier is where the /sql handler resides. The /sql handler takes the SQL query and translates it to a parallel query plan. It then selects worker nodes to execute the plan and sends the query plan to each worker node to be run in parallel. Once the query plan has been executed by the worker nodes, the /sql handler then performs the final merge of the tuples returned by the worker nodes. The workers in the worker tier receive the query plan from the /sql handler and execute the parallel query plan. The parallel execution plan includes the queries that need to be made on the Data Table tier and the relational algebra needed to satisfy the query. Each worker node assigned to the query is shuffled 1/N of the tuples from the Data Tables. The worker nodes execute the query plan and stream tuples back to the worker nodes. The Data Table tier is where the tables reside. Each table is its own SolrCloud collection. The Data Table layer receives queries from the worker nodes and emits tuples (search results). The Data Table tier also handles the initial sorting and partitioning of tuples sent to the workers. This means the tuples are always sorted and partitioned before they hit the network. The partitioned tuples are sent directly to the correct worker nodes in the proper sort order, ready to be reduced. The image above shows the three tiers broken out into different SolrCloud collections for clarity. In practice the /sql handler and worker collection by default share the same collection. Note: The image shows the network flow for a single Parallel SQL Query (SQL over MapReduce). This network flow is used when map_reduce aggregation mode is used for GROUP BY aggregations or the SELECT DISTINCT query. The traditional SolrCloud network flow (without workers) is used when the facet aggregation mode is used. The client sends a SQL query to the /sql handler. The request is handled by a single /sql handler instance. The /sql handler parses the SQL query and creates the parallel query plan. The query plan is sent to worker nodes (in green). The worker nodes execute the plan in parallel. The diagram shows each worker node contacting a collection in the Data Table tier (in blue). The collection in the Data Table tier is the table from the SQL query. Notice that the collection has five shards each with 3 replicas. Notice that each worker contacts one replica from each shard. Because there are 5 workers, each worker is returned 1/5 of the search results from each shard. The partitioning is done inside of the Data Table tier so there is no duplication of data across the network. Also notice with this design ALL replicas in the data layer are shuffling (sorting & partitioning) data simultaneously. 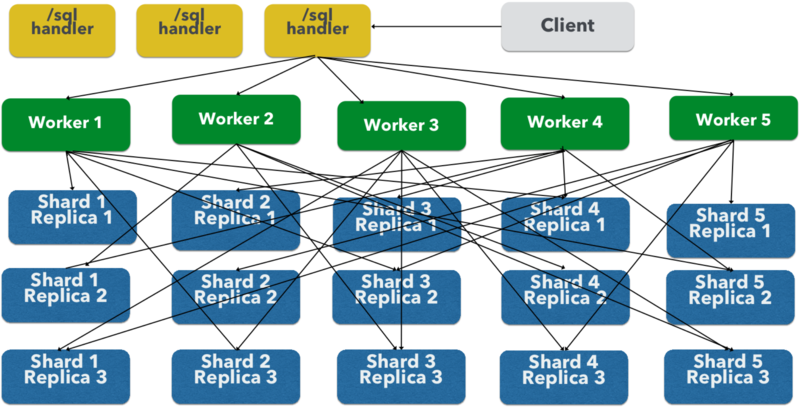 As the number of shards, replicas and workers grows this design allows for a massive amount of computing power to be applied to a single query. The worker nodes process the tuples returned from the Data Table tier in parallel. The worker nodes perform the relational algebra needed to satisfy the query plan. The worker nodes stream tuples back to the /sql handler where the final merge is done, and finally the tuples are streamed back to the client. The SQL interface supports queries sent from SQL clients and database visualization tools such as DbVisualizer and Apache Zeppelin. If you are using Maven, the org.apache.solr.solr-solrj artifact contains the required jars. There are other parameters that can be optionally added to the connection string like aggregationMode and numWorkers. A step-by-step guide for setting up DbVisualizer is in the section Solr JDBC - DbVisualizer. A step-by-step guide for setting up SQuirreL SQL is in the section Solr JDBC - SQuirreL SQL. A step-by-step guide for setting up Apache Zeppelin is in the section Solr JDBC - Apache Zeppelin. Examples of using Python and Jython for connecting to Solr with the Solr JDBC driver are available in the section Solr JDBC - Python/Jython. Examples of using R for connecting to Solr with the Solr JDBC driver are available in the section Solr JDBC - R.